As you can tell now, it worked out: I recently joined Interaction Partners, an early-stage investor relations startup in Zurich. However, the journey to get a job in a startup was anything but easy. In this article I’ll focus on the challenges I met during my startup job hunting and share possible ways to deal with them. Where to find job offers? Have you ever opened up a job search and after several hours left completely empty-handed? Well, in my case this was probably because the jobs I was searching for didn’t even appear on platforms like jobs.ch. Looking back, it’s obvious that most startups don’t have a large recruiting budget, hence they don’t post their open positions on big, expensive job boards. Realizing this, I changed to smaller, more startup-specific platforms like earlyhire and joined a Facebook group called “Zurich Startup Jobs”. Here, I found a couple of interesting openings. Other job ads were posted exclusively on the websites of the respective companies and some (actually most of them) were even only somewhere in the heads of the “way too busy for that admin stuff” startup founders. Not knowing how to approach the last category of non-existing “job ads” I started working on a strategy to apply for the jobs I had found on smaller platforms and company websites. However, I soon realized that my mainstream cover letters full of empty standard phrases were not appropriate to apply for those kind of jobs. I had to stand out, but how? I couldn’t find specific format rules, nor other clear instructions to follow. It took me quite a while to change my dossier to a – still professional – but much more personal and meaningful one. Considering that it was the complete opposite of what we were taught at school for years, it was surprisingly hard for me to get creative in that field. How to apply for a job that doesn’t exist yet? That one seemed like a mission impossible until I found out that it was not about «how to apply for something that doesn’t exist?» but rather «how to get in touch with the busy entrepreneurs who might have an open position in their own startup or know somebody else who does?». All my friends know that I like to talk. For once this turned out to be a big advantage. Be it the girl next to you in the group fitness class or the guy you meet at the tram station – whenever possible, tell them what you’re looking for. I made the experience that many people have interests or connections I didn’t know anything about. Platforms, such as meetup or Eventbrite are very useful to find startup events in your city. By that time, I had no idea how thriving the startup community in Zurich is! There are overwhelmingly many events to go to, so many workshops and programs to participate in. And attending some of these events, I got even more referrals for happenings or networking groups to join. I got to know many incredibly interesting people from all over the world – all working in different sectors and with different backgrounds. Every single encounter was valuable in its own way: Whether it was directly linked to my goal to find a job in a startup or it simply broadened my horizon. Reaching out to people I didn’t know and asking them if they would like to have a coffee with me to talk about their business or project was definitely the supreme discipline. Seriously, it took me a lot of courage to push the “send” button but sometimes you just have to jump and see what happens, right? Some of them did never reply, others declined, but to my surprise the vast majority reacted very nicely and accepted the invitation. Interesting conversation or awkward silence? Can I add enough value to the conversation? Why does that person even take the time to talk to ME? Will we have enough topics to talk about or will this awkward silence dominate our meeting? Fortunately, ALL these concerns were unjustified, since most entrepreneurs have one thing in common: They love to talk about their ideas and are more than willing to share best practices if they see that somebody is curious about their mission. After having applied for different jobs and talked to many, many people one of my former bosses suggested meeting her brother, who recently started his own business and could probably give some advice on how to navigate the startup community. So, I got to meet Flurin Capaul, founder of Boonea, who introduced me to Manuele Fumagalli, founder of Workspace2go, who after a while and completely unexpectedly sent me a text message saying “Hey Nadia, do you still want to work for a Startup? I know somebody who is probably hiring soon…”. And that’s how I met Kilian, one of the founders of Interaction Partners. If I could inspire you to expand your network and meet somebody for a coffee, I highly recommend checking out Auer & Co, the café in the ground floor of the building where I work now. 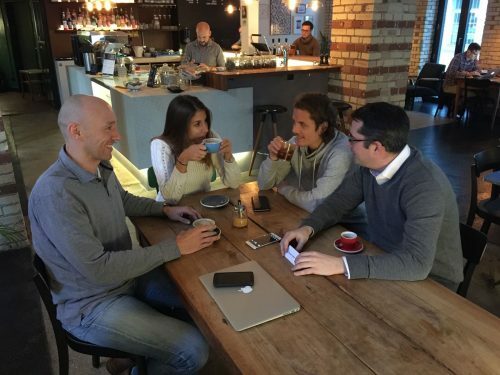 Great coffee and entrepreneurial vibes are guaranteed! You have to hustle – nothing can be created out of nothing! This post was first published by Nadia on her Linked-In account.